Music sheet “Col. J.F. 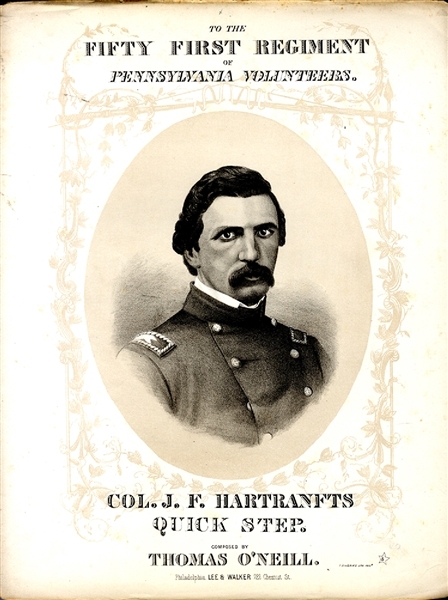 Hartranft’s Quick Step”, 8pp., by Thomas O’Neill, published by Lee & Walker, 1862. The cover has an oval illustration on Hartranft. John Frederick Hartranft (1830-1889) was the United States military officer who read the death warrant to the individuals who were executed on July 7, 1865 for conspiring to assassinate American President Abraham Lincoln. Previously having achieved the rank of major general of the Union Army during the American Civil War, he had also been awarded the U.S. Medal of Honor for his actions in the First Battle of Bull Run.